What path did you take to get to your current role? I began my library career as a page (shelver) in a branch of a medium-sized public library system. It was a part-time job to earn a bit of money during college and to figure out if it would be worth pursuing at the graduate level. After a few months, I was promoted to a part-time circulation position. A few months later, I entered library school and accepted a position as a graduate assistant in technical services/special formats in the Fine Arts Library at the university. I was lucky to get a job as a cataloger almost immediately after graduating. After about 18 months in that position, I accepted the position of Technical Services Coordinator at yet another institution. I’ve been here almost 8 years. My role requires an excellent understanding of traditional acquisitions and cataloging skills. It’s also important to have a fairly high comfort-level with reference and instruction. Generally, it requires the ability to have a high-level understanding of the overall operations of the library and the way various departments interact. Less traditional skills (which are becoming pervasive and are likely to be considered traditional before long!) are the ability to understand and maintain the back-end of numerous software/e-resource admin systems, managerial skills, accounting skills, and the patience to deal with the never-ending sales calls. I work most often with our integrated library system (Voyager and its accompanying Oracle-based reporting system), a link resolver (SFX), electronic resource management system (Serials Solutions), online ordering systems (including YBP’s Gobi and EBSCO’s Ebsconet), and various back-end database/journal publisher platforms. Ensuring that everyone has what they need to complete their research in the fact of static (or decreasing) budgets. It varies, but I’ve seen quite a few really interesting job ads lately for people with some experience. I don’t keep much of an eye on entry-level jobs, but they’re definitely out there. Do you have any advice for people interested in pursuing a role in your genre of librarianship? Two things: Do everything in your power to get experience BEFORE you graduate. Even “entry-level” jobs require experience these days. And, be willing to consider opportunities outside of your current/preferred geographic area. Many, many institutions in more rural areas really struggle to fill positions, but those jobs can help you get the experience you need in just a few years to get an amazing job somewhere you’d rather be. After completing an arts degree in English and Geography at UCC, I did a Graduate Diploma in Business Studies in the Michael Smurfit School of Business at UCD. Whilst at UCD I saw a post for a pre Library course internship for one year at King’s Inns Library. I did this and subsequently the GradDipLIS at UCD. 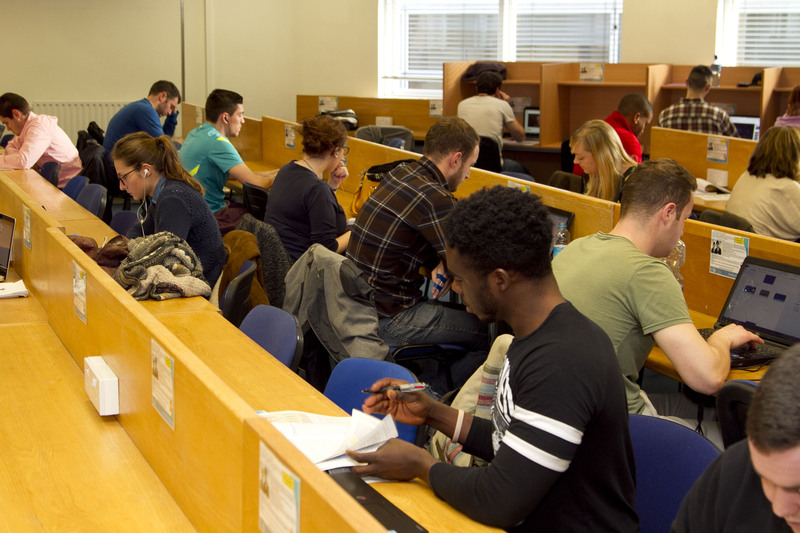 Whilst doing the MLIS I worked as a part time library assistant at DIT. I continued in this role after graduation, going on to work as Senior Library Assistant at DIT, Assistant Librarian at the South Eastern Health Board, an Assistant Librarian at the Welsh Office, an Assistant Librarian at UCD, an Assistant Librarian at the Oireachtas and finally to my current post at DBS Library. I worked as a library assistant for about two years after completing my MLIS. I believe that library graduates shouldn’t get overly focused on getting a professional post upon graduation. If you can obtain a professional post – that’s great but don’t hold out for a professional post solely. Just get working in a library. Get library experience- the rest follows. When I qualified there was quite a lot of contract work in libraries. Rather than fixating on securing a permanent pensionable job, I did a number of contract posts to build up experience. This helped me to secure a permanent job at DBS. Although I didn’t go down the business road, my business studies qualification helped me re HR, management issues. Bring what you have learned from your studies in their entirety into your current role even if it isn’t specifically library related. There is no typical day for the modern library manager. I am responsible for the strategic management of the Library so oversee a lot of library projects and developments in all areas of library operations. I am also involved in the library and research elements of programmatic and new validation events which are conducted by Quality Qualifications Ireland. I also devote time to marketing the MSc in Information and Library Management at DBS, a programme that I am passionate about. Good collection development and IT skills. Ultimately a library is about providing access to materials for the empowerment of its users in the format that they require. Project management is not a skill that is taught in library schools. This is pity. Most library projects are large scale projects. These projects must be implemented in an efficient and cost effective manner with maximum outcomes for all stakeholders. The implementation of a new Library Management System for example is a huge project involving thousands of book and patron records. You also have to maintain essential library services whilst implementing these projects. One of the most important roles to emerge in libraries over the last decade is the role of the systems librarian. They are a huge resource when implementing any library project with a technical element. I am very fortunate to have an excellent systems librarian who you may know: David Hughes. Metrics and statistics are everything re showcasing to management, quality assurance agencies and other stakeholders the success of your department. For this reason I like the reporting and statistical modules of Koha and library databases. Healthy circulation figures, database usage figures also help to make the case for the renewal of library subscriptions. Assisting the learner in achieving the learning outcomes of their programme. I also enjoy developing library staff professionally. DBS Library has a high retention rate re its staff. This is wonderful as we retain key staff who bring huge value to the department. The flip side of this is that it means that there are fewer promotional opportunities for library staff that are starting out in their careers. Over the last few years we have created a number of professional roles in DBS Library including the Systems Librarian, Information Skills Librarian (a teaching librarian), a Research Librarian, an Acquisitions Librarian and others. Career prospects are good and many of these professional roles are occupied by DBS Library staff who were formerly library assistants who completed their postgraduate library qualification. 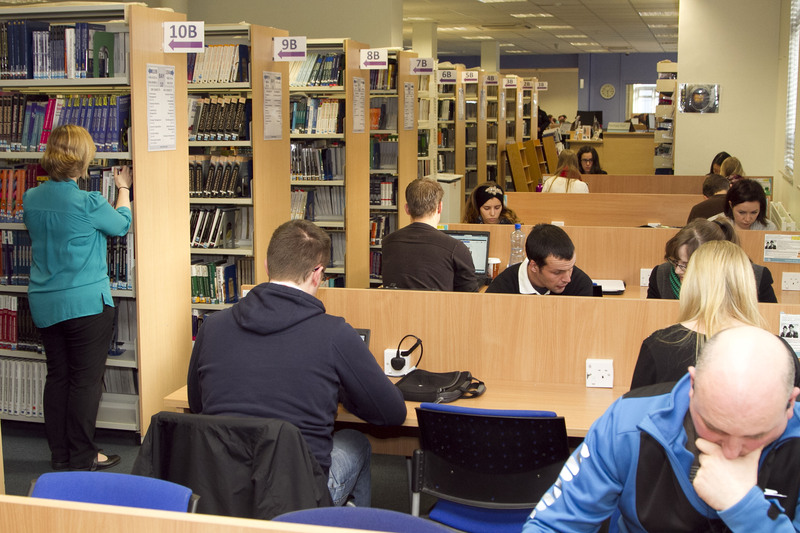 Full-time library assistants at DBS are also entitled to pursue the MSc in Information and Library Management for free. Staff retention is high so opportunities don’t come up frequently. More recently some of our library staff have moved on to positions such as the Library Manager at Barnados and Executive Librarian at Wicklow County Council Library. This created promotional opportunities for remaining staff. I believe that the experience one obtains at DBS Library is invaluable in building ones library career. We also offer short stints of unpaid work experience to library graduates wishing to build up their CV. The old adage – get your foot in the door – be it a short stint of unpaid work experience, a job bridge contract or part-time library work. At DBS Library we have recruited part-time and full-time staff from people who have carried out work experience with us because they have made an impression on us etc. Also keep learning. Even if you don’t have a lot of money – there are free Moocs that you can pursue that provide a talking point in interviews. Have a good CV which showcases your skills. Practise for interviews. I am a great believer in the mock interview prior to doing an actual interview. Get a more experienced librarian to ask you relevant questions etc. by way of preparation for the actual interview. Find a mentor in the library profession with significant experience who can provide advice and support re your career development. I do a lot of this and find it very rewarding.